Huawei has been making noise for months about its upcoming flagship/iPhone killer, the Mate 10. At a launch event in Munich, it unveiled three variants of the flagship handset: the 5.9-inch Mate 10, the 6-inch Mate 10 Pro (pictured above) and a Porsche Design edition of the Pro. 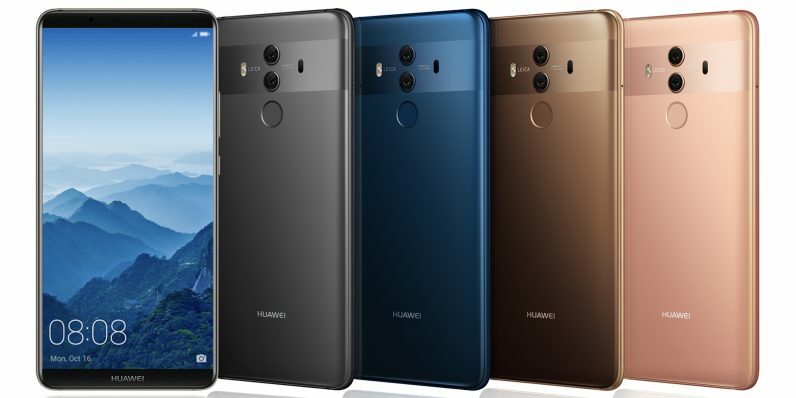 There are a number of reasons why Huawei thinks it can rival not just premium Android phones, but also the latest iPhones, with its new lineup. For starters, all three dual-SIM Android 8.0 devices are powered by the company’s own Kirin 970 processor, which serves up 2.36 GHz octa-core performance, along with a Neural Processing Unit (NPU) for on-device, real-time AI applications. Huawei says its Mate 10 Pro is about twice as quick as the iPhone 8 at recognizing the content of images (for example, whether a certain photo includes a dog), and more than 25 times faster than a Samsung Galaxy S8 at the same task. However, this is just a single arbitrary benchmark that doesn’t tell us enough about just how useful the increased performance will be – especially considering that there aren’t many apps that take advantage of on-device AI computation at present. It does work with Bing’s Translator app for offline capabilities, but voice translation isn’t supported at launch. The SoC also includes an advanced LTE modem, dual image sensor processors for better camera performance, and support for download speeds of up to 1.2Gbps on the Mate 10 Pro. In addition, the lineup is capable of dual 4G connectivity as well as dual VoLTE. Next, the narrow bezels on the Mate 10 allow for a significantly higher screen-to-body ratio than the iPhone 8; the Mate 10 Pro correspondingly outdoes the iPhone X on this front, but by a lot less. The Pro will also allow for multi-column viewing on its 18:9 screen, so you can run two apps side by side in landscape mode. They also come with 4GB RAM (with 6GB RAM options on the Pro), a minimum of 64GB of onboard storage, 4,000mAh batteries for up to two days of use on a single charge, and the ability to charge up to 58 percent capacity in just half an hour. There are also a few other interesting features, including lossless audio playback, LinkedIn integration in the address book and intelligent voice amplification so you can whisper in any environment on a call and have your contact hear you clearly. In addition, the Mate 10 range can connect to an external display to mirror or handle dual-screen duty with a single USB-C-to-HDMI cable, while offering a virtual mouse and keyboard on the phone. They’ll also hide notifications from the external display, and you should get about three hours’ use in this mode. That means you don’t need a dock, but you’ll also use up plenty of power in the process. While most of the internals are the same across the three devices, the standard Mate 10 differs from the Pros in that it has a 5.9-inch FullView HDR LCD display with a 16:9 ratio 2K resolution (2,048×1,080 pixels) screen with slightly larger bezels at the top and bottom, includes a headphone jack and isn’t IP67-certified for water resistance. The two Mate 10 Pros sport 6-inch OLED displays at 18:9 Full HD+ (2,160×1,080) resolution, with slimmer bezels. Because of that slight difference in components, you’ll get true blacks on the Mate 10 Pro screen, as well as UP67 water and dust resistance (which means the device can be submerged in water one meter deep for up to 30 minutes). As with its predecessor, the Mate 10 features a primary camera system developed in partnership with Leica. This time around, you get a 20-megapixel monochrome sensor and a 12-megapixel RGB sensor, paired with f/1.6 Leica Summilux-H lens and optical image stabilization and 4-in-1 hybrid autofocus. While I only got a few minutes with the Mate 10 and Mate 10 Pro, I did find the camera to be quick and capable of good shots. The company’s demonstrated images displayed high levels of detail and controlled highlights in low-light scenarios. If it improves on the Mate 9’s camera by any stretch, Huawei will have a winning shooter on its hands. The AI chip helps the camera detect 14 different kinds of scenes – such as pets, portraits, low-light conditions, and food – and automatically adjusts the shooting parameters to get a good shot. As with the Mate 9, the 10 promises to deliver quick performance even after 18 months of use. That remains to be seen, but hopefully the NPU will help with that, as well as with optimizing power usage for increased battery life. Huawei explained that an on-device user behavior model is built to create an adaptive power allocation strategy, and that helps the phone offer up to 20 percent longer battery life. With that, Huawei has a strong contender for the battle of the flagships this year. With impressive build quality, a powerful camera system and a future-ready AI chip, it’s really bringing the fight to the iPhone. What remains to be seen is how the company works with developers to make use of the NPU, so as to make the Mate 10 worth the premium pricing. All three phones will become available next month. The Mate 10 goes on sale at €699 ($825) across China, Mexico, New Zealand, Australia, Spain, Egypt, and a few other Asian markets. The Mate 10 Pro will cost €799 ($943) and will first arrive in several European and Asian countries, Peru, South Africa; the UK’s also on the list. The Porsche Design Mate 10 will set you back by €1,395 ($1,647) and will be available in similar markets as the Mate 10 Pro.